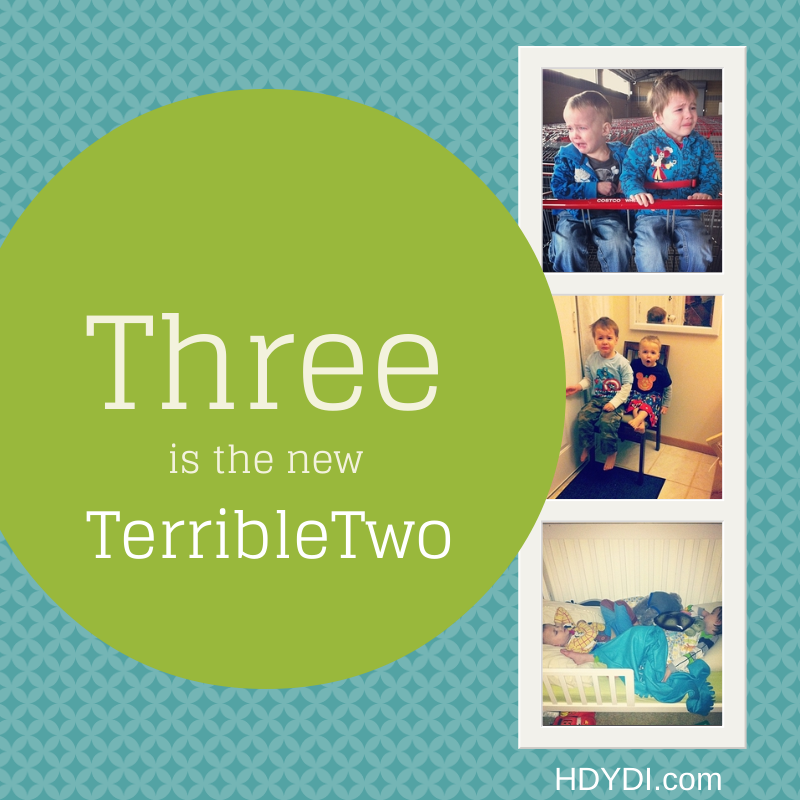 Toddler Thursday: Three is the New Terrible Two | How Do You Do It? My twin boys turned 4 in November and while I am not in any hurry for them to grow up, I won’t lie, I was counting down the days until age three hit the road. Age 3 was brutal. It was long. It was way worse than age 2, truly. Heck, give me two newborns again any day! As a small sample of age 3 in our house, here is a copy-and-paste comment I left when another twin mom asked about transitioning her twins to toddler beds from their cribs. Comments before mine were along the lines of “it wasn’t as big of deal as I thought” or “my kids never realized the could get out of their beds.” I offered up my very honest experience. Wow. Our transition was nothing at all like that. My kids destroyed everything in their room, we had to lock the dresser in the closet because they were stuffing clothes down the heater duct, then replace the duct cover with a metal one that is screwed into the floorboards because they were hitting each other with it. We turned the door knob around so it locks from the outside because they got out one morning at 5 am and flooded the bathroom. We have had to replace the blackout shade and the closet door because they broke them. We had to take their beds away for a month and they slept on a mattress on the floor because they were lifting up the mattress and climbing under and the other was jumping on top. We had to remove all the decorations because they took them off the walls and either ruined them or hit each other with them. They propped the mattresses up against the wall, climbed on them and jumped off which resulted in an ER visit because one kid knocked himself out cold. It’s now 2 years later and only within the last 6 months have they actually gone to bed reasonably and without the destruction, but at least twice a week we end up having to lock the door to keep them in because they won’t stay in bed. However, the first 6 months they were on beds when they’d finally fall asleep 90 percent of the time they were together in the same bed which was outrageously cute and sweet. So during my tenure as a mom to age 3 twins, there was a whole lot more of that flavor of crazy. There were many trips to the doctor and the ER (because of course these incidents almost always occurred at nights and weekends, naturally.) There was so much frustration, so much yelling, so many time outs and leaving places and skipping activities all together. People never said, “I always wanted twins!” to us anymore when we were out. 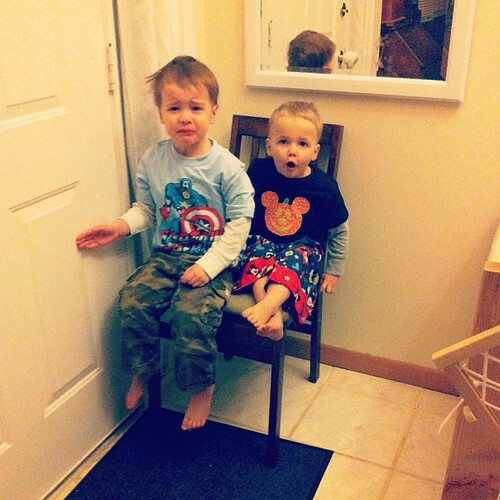 The time-out chair was at maximum capacity pretty often. Everything was hard. Everything. Running errands, meal times, bed time (Oh, bedtime, simultaneously my most longed-for and most reviled.) Every day I would wake up optimistic and by the time the kids were in bed I was exhausted and defeated. I would sit on the floor next to my sleeping children and cry because it was just SO HARD. I was sure I was the worst Mom ever and that I was raising sociopaths. I loved my children so much it hurt, but there were definitely days I didn’t like them a whole lot. But now they are four. And so far, four is better. I feel like we have turned a corner. They gave up napping so they are plenty tired most nights when they finally stop bouncing around the room. Getting ready for bed is still a three-ring circus, but I will take my victories where I can get them. Both boys started preschool this fall. The extra structure and routine has helped tremendously. Errands with both are still hard, my kids feed off each other so when it starts to go south it goes in a hurry, but we have had successful outings more often. We also use a lot of rewards for good behavior when running errands, and they buy into the bribery rewards. They play together and cooperate and help each other out. They have genuine concern for one another and work as a team, more often for good than for evil. So from the ashes of age 3 have emerged two sweet, smart not-so-sociopathic 4 year olds. And man are they the best. Jen is the stay-at-home mom of newly minted 4 year old boys who all survived the terrible threes. They live in the arctic wasteland of Chiberia, formerly known as Chicagoland, where they have been cooped up inside for the worst winter in half a century, left with plenty of time to reflect and reminisce. Her family blog Go Team Wood is oft-neglected and now functions mostly as a repository for Instagram pics and occasional updates that are far and few between. I feel like I hardly have to leave this comment because you know how much I hated age 3. I say this jokingly, but at the time I was quite serious: I wasn’t sure who would end up in an institution, me or them. I cried so much that year. It was the only time I felt like perhaps I wasn’t cut out to be a mother, that perhaps my daughters would be better off without me. And then three ended and they got better. I guess one year I’d rather forget out of 8 isn’t so bad. I’m SO glad things are better for you and your boys! There were so many times last year I wished I lived closer to you! Love it Jennifer! Love it! 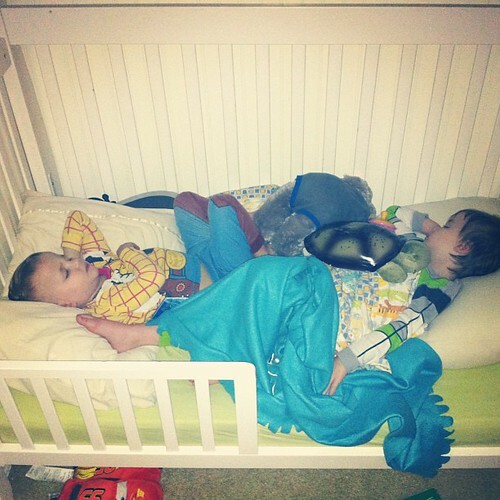 We also had some crazy antics while switching over to the toddler beds… Oh boy. We ended up sitting in their rooms until they fell asleep in order to keep the order. We figured sacrificing the time on the front end was worth our sanity on the back end!! I’m glad your boys are 4 now. My girls will be four in April! I can’t wait, even though threes haven’t been too terrible. Wow…yeah, cannot say I am looking forward to that! 😉 I was all excited that Isaiah is going to BE three in July…here’s hoping we are one of the blessed ones who find age three is better than two! Eek! Thank you for sharing this Jen…at least if I find myself sobbing next to my sleeping kids, I will know I am not the only one! MandyE found 4 to be her most challenging age too! http://hdydi.com/2013/09/18/the-most-challenging-age/ Good luck to you! My boys are 3 now and I’m going through exactly what you described. This is definitely the toughest age so far. But I’m happy to hear there’s a light at the end of the tunnel. Yikes! I wonder if the boy/boy combo has anything to do with how difficult it is. Each age I think is harder than the previous year. I keep wondering why the first couple years everyone said it gets easier, because I haven’t found that to be true. What’s wrong with my parenting that its not seeming to get better. My two boys are four now and so far (3 months in) it’s just as difficult as three was. There are lots of fun things about this age too, though. They say the funniest things. I think that a lot of aspects of parenting get physically easier but intellectually and emotionally harder. This. This, this, this. And mine are only two and a half. At age four and a half, bedtime is much better than age three, but we still don’t have blinds or curtains on the windows, the closet is locked, and the only furniture is two beds! I’m always afraid to tell a mom of a 2 year old about how bad 3 is. But it’s so bad. I can confirm this as well with my soon to be four year old younger singleton. Husband and I often speak wistfully about how much time is left until she’s four. To be fair though she seems to be “coming out of it” a little earlier than the twins did. They must be better influences. Oh, and on the crib/bed front I tell every mom the same advice I heard (and respected – perhaps from Laura C): Wait as LONG AS YOU CAN. I also had to put locks on my son’s door when he was in the bed because he’d wander the house in the middle of the night. I miss that lock – might need to reinstall again since he’s up to his antics. I 100% identified with this post. 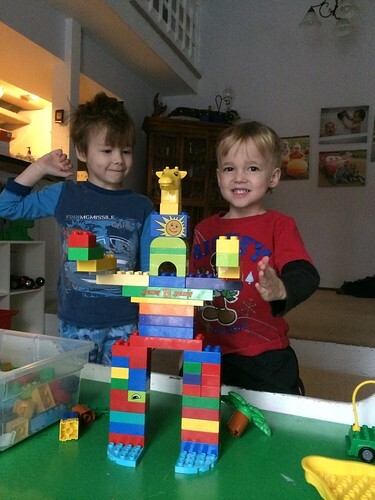 My boys are turning 4 today….and I can say in the last month they have already been SO much better. As I was reading this post every single thing was something I also experienced or wouldn’t have been at all surprised to have happen- and my boys still have mattresses on the floor because the second we put them in a bed-one climbs between the mattresses while the other one jumps on top! When my kids were babies a good friend said that he never thought 2 was difficult but that 3 year olds were basically 2 year olds with intent- most definitely true for us! So I wasn’t alone in this thinking! Three was THE WORST! Yes, at four, we are still dealing with completely irrational beings (ex: one screaming because a garbage truck passed by on his brother’s side of our van, and not his side) but four was definitely a bright light at the end of the 365-day-three-year-old-twin-boys tunnel! Glad you are finally out of the rut, too 😉 Stay Strong, Momma! I am a young mom of twin identical boys that are ALMOST TWO…and Im not sure if reading this gave me hope or made me more terrified. 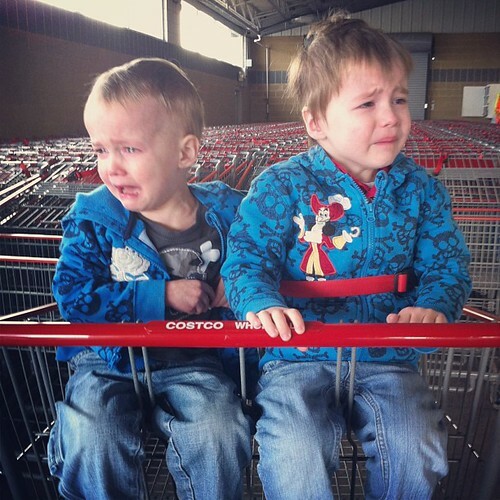 I know one thing is for sure, i have said on several accounts….i have to be the worst mom ever for my boys to act like this and id almost rather do newborns again. I can relate to so many of your toddler bed transition as that has just happened for us. Pingback: Separate Preschools - An End of Year Update - How Do You Do It?